...the French megabanks are on the hook! 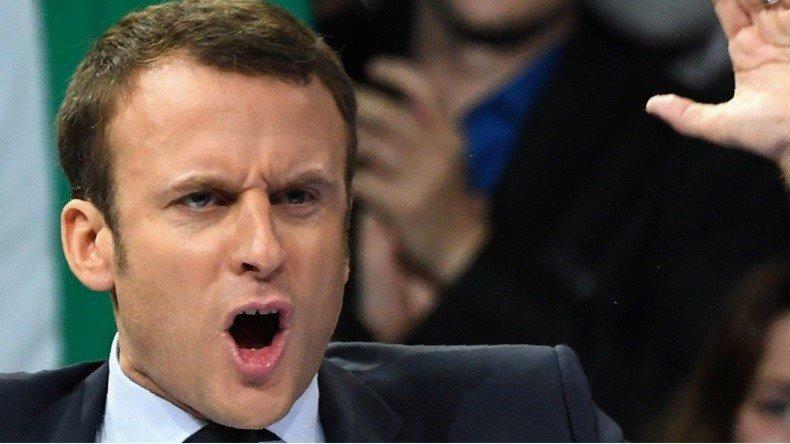 France was just served with a stark reminder of an inconvenient truth: €277 billion of Italian government debt — the equivalent of 14% of French GDP — is owed to French banks. Given that Italy’s government is currently locked in an existential blinking match with both the European Commission and the ECB over its budget plan for 2019, this could be a big problem for France. On Friday, France’s finance minister, Bruno Le Maire, urged the commission to “reach out to Italy” after rejecting the country’s draft 2019 budget for breaking EU rules on public spending. Le Maire also conceded that while contagion in the Eurozone was definitely contained, the Eurozone “is not sufficiently armed to face a new economic or financial crisis.” As Maire well knows, a full-blown financial crisis in Italy would eventually spread to France’s economy, with French banks serving as the main transmission mechanism. France isn’t the only Eurozone nation with unhealthy levels of exposure to Italian debt, although it is far and away the most exposed. According to the Bank of International Settlements, German lenders have €79 billion worth of exposure to Italian debt and Spanish lenders, €69 billion. In other words, taken together, the financial sectors of the largest, second largest and fourth largest economies in the Eurozone — Germany, France and Spain — hold over €415 billion of Italian debt on their balance sheets. While the exposure of German lenders to Italian debt has waned over the last few years, that of French lenders has actually grown, belying the ECB’s long-held claim that its QE program would help reduce the level of interdependence between European sovereigns and banks. 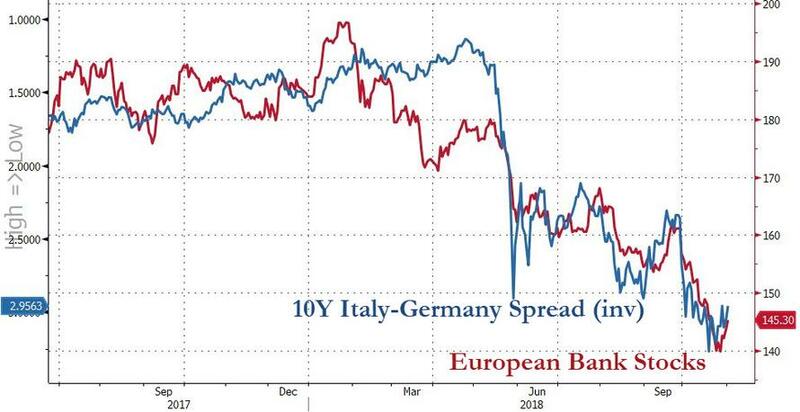 If anything, the opposite has happened: thanks to the ECB’s tireless efforts to underpin the Eurozone’s bond markets (by doing “whatever it takes” to make sovereign bonds virtually risk-free), banks have been able to make a tidy margin by simply bulk-buying government bonds at officially zero risk. A few years ago fiscally hawkish Eurozone countries such as Germany, the Netherlands, and Finland lobbied to put an end to this practice by removing the risk-free status of certain risk-prone sovereign bonds. But their efforts were staunchly opposed by French, Italian and Spanish politicians and bankers, who feared that any such move would result in market mayhem. Today, market mayhem is not off the cards. The dispute over Italy’s draft budget is unsettling investors. This is reflected not only in the spread between Italian and German ten-year bond yields, which hit four-year highs a couple of weeks ago, but also the sentix Euro Break-up Index, which in October rose to its highest level since April 2017, mainly due to the strong rise in the Italian sub-index. On a more positive note, investors do not yet appear to fear negative contagion effects, as reflected in the low rise of the Greek sub-index and the index for the contagion risk, which even dropped slightly from 36% to 33%. In other words, investors don’t yet fear for the stability of the Eurozone. But as Bloomberg points out, the exposures of French and German banks to Italian debt mean that those countries’ leaders are strongly incentivized to seek a compromise in the current standoff over Italy’s government budget. Italy’s coalition partners are perfectly aware of this fact. They know that during the Greek crisis of 2010-11, French and German banks held around $115 billion of Greek debt. That was enough to convince the French and German governments of the day to offer Greece a partial bondholder bailout, though eventually, some private-sector bondholders were given a large haircut as part of the deal. This is all perfectly understood by Italy’s government, as is the fact that French, German and Spanish banks are now far too exposed to Italian debt for their respective governments to even entertain the idea of pushing Italy to the edge. That knowledge is fueling the coalition government’s bravado, with some lawmakers now even talking about extending Italian government funds to struggling Italian banks if economic conditions continue to worsen. “Brussels would love to see our defeat,” said Claudio Borghi, the Lega economics chief and budget chairman in the Italian parliament. Lorenzo Bini-Smaghi, a former member of the ECB board, disagrees. He believes that events are following a similar script to the onset of the Eurozone debt crisis in 2011, when surging bond yields caused a massive contraction in credit. “Italy is going straight into a wall,” he says. It may sound like rank fear mongering from a dyed-in-the-wool eurocrat, but besides being a former central banker, Bini-Smaghi is also the current Chairman of Société Générale, France’s second largest bank, which is presumably filled to the gills with Italian debt. As such, he probably has even more to fear from a full-scale Italian debt crisis than most.